Just a foundational book, and the reader is caught up in fascination with its sheer detail. For the Mongol invasion, its virtue is that it quotes the conflicting accounts of different Muslim historians. Juvaini (Genghis Khan: The History of the World-Conqueror) is a great read, and perhaps most accessible in English, therefore used; but other historians often flatly contradict him – and each other. A confusing situation, but a lesson in how much we don’t know for certain. When I first read this, my general note on it was, ‘an antidote to Juvaini, and Juvaini-derived’. That is, it often surprised me, and I saw that our history still depends on what Juvaini said. My main impression of this was that here we have the alternate accounts of events. For figures, this is typical: “Juzjani maintains that Kharpust collected an army of 130,000 men, with which he prepared to attack Chingiz-Khan, while Juwayni puts the total of his forces at 20,000.” Which is it? I’m rather glad that Barthold doesn’t decide which it is. I’m not sure that we have better means of deciding, either, since 1900. What about atrocities? “Ibn al-Athir says that the town surrendered and was spared, Juwayni that Chingiz-Khan accepted the submission of the inhabitants, but afterwards broke his promise and ordered them to be killed.” In his introduction on the sources, Barthold grants them a lot of historical sincerity – they strove to record the truth, even if they had partialities – but I think the point is, we shouldn’t underestimate the confusion of affairs. How accurate history was meant to be written in the circumstances, I don’t know; and that means we probably can’t write it today, at least without question marks on every page. Barthold gives enough of the original historians for his book to have the almost first-hand, story-like charm that they do. 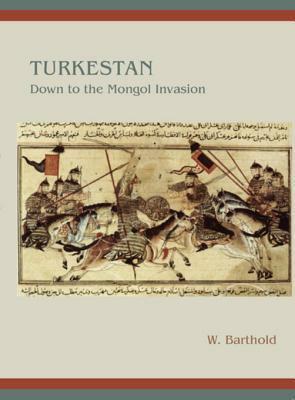 Sign into Goodreads to see if any of your friends have read Turkestan Down to the Mongol Invasion. Those historical accounts are so far apart a mongol horde could ride between them. Great review and eye-opening. Joseph wrote: "Those historical accounts are so far apart a mongol horde could ride between them."